Home » Out-of-place artefacts » Very ancient artefacts » A ‘carved’ fossil shell? In 1881, the architect and engineer Henry Stopes (1852-1902, father of the feminist and pioneer of birth control, Marie Stopes) presented a curious fossilised shell of the species Pectunculus glycimeris, with a crude but recognisable human face on its surface, at the York meeting of the British Association. As well as the ‘face’, there was a hole close to the top of the shell, evidently to enable it to be suspended. According to his account, the shell had been found some years before in the well known Late Pliocene shell-bearing deposits at Red Crag, Suffolk. He presented it as evidence for very early humans in England (Late Pliocene deposits date from between 2.1 and 1 million years ago), but it was not well received by the members of the Association, who seem to have held the carving up to ridicule. No academic journal would accept it for publication and he resorted to a self-published pamphlet. A cursory glance at a photograph of the object reveals that there is no trace of deliberate carving and the overall impression is that it belongs to the same class of artefact as the ‘Face’ on Mars. The face resembles those carved into pumpkins at Hallowe’en by American children, consisting of two round ‘eyes’ above a crescentic ‘mouth’. It is tempting to regard it as a simulacrum, a natural object that nevertheless bears a resemblance – albeit slight – to a human face. However, in an issue of Lithics (volume 30, 2009), Francis Wenban-Smith argues that it is a genuine discovery, but of medieval rather than Pliocene date. 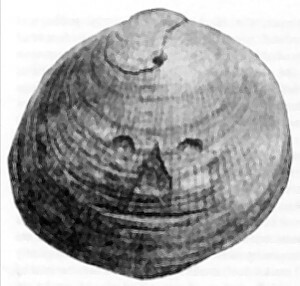 He notes that the face was carved after the shell had already become fossilised, so if it was found in Red Crag deposits, it could well have been carved long after the Pliocene. Its provenance is not certain: Stopes was given it by a collector friend in 1880, who had apparently found it some years before. There was sand embedded in cracks in the shell and it had the typical staining of Red Crag deposits, so there is little reason to doubt its provenance; what is less clear, though, is whether it came from undisturbed Pliocene deposits or from a talus formed from material derived from those deposits. Francis Wenban-Smith suggests that it should be compared with the scallop shells (associated with Santiago de Compostela) sewn onto clothing by medieval pilgrims and notes that many such tokens were deliberately buried in locations overlooking the sea. This would account for the site of discovery. However, the childish appearance of the face, which prompted the laughter of the members of British Association in 1881, does not look medieval and raises suspicions of forgery, not by Stopes and not necessarily by the collector from whom he obtained it but by persons unkown. 8 Responses to A ‘carved’ fossil shell? The childish appearance of the face could be simply explained as the carving being done by a child. Reasoning? The claiming that if it’s not a simulacrum that it is a pliocene shell that had been carved by a person who could have given it to or been a medieval pilgrim. That person may have been a child who was in apprenticeship with a crafts person and be one of their earliest works. Actually the location near the sea makes this even more plausible because medieval pilgrims took boats to the continent on pilgrimages. A craftsman would logically have a regular supply of tourist equivalents (pilgrims) looking for good luck charms, equipment, provisions and such. Meaning it makes pure economic sense that craftspeople would be more common at sea ports. Pilgrims were also in high regard and perhaps there was a little boy who gave his crappy little shell to one of them, who took it politely because what a cute little person he is doing such a sweet thing, and then just dumped it with the rest when the kid wasn’t looking. I think Gonzalo is making a failed attept to rebuke something he just imagines you to do. Treating everything in science contradicting his particular version of Creationism as a single, hermetical system is bad enough. Beleiving it to be intrinsically linked to literal worship of specific life-forms and/or homosexual behaviour only makes you look like an idiot to your opponents. As a geologist this sort of thing offends me. It offends me as an archaeologist, too! I came here not as an archaeologist, nor as a geologist, but as someone interested in, ‘bad archaeology’ who finds many videos on YouTube about Michael Cremo’s off beat ideas, and wants to find an alternative, but mainstream explanation for the allegedly out of place artefacts, and what do I find? Out of place Christian Fundamentalists who are not only s***ing on someone else’s turf, but on another person’s religious turf. Why can’t they take their interdenominational squabbles somewhere else? For the record, I think with all the millions of fossils found that have good provenance, it is far more likely that this is either a naturally formed simulacrum, or that it was carved after the fossil was formed, than it can be INTERPRETED to have been carved by a human being and then become fossilised during the Pliocene; particularly as Wenban-Smith says it has apparently been carved after it became a fossil. I have heard Cremo claim that the fossil is too delicate to have been carved in its fossilised state. I found that claim of Cremo dubious to say the least. Primitive people with primitive tools have achieved all kinds of delicate jewellery effects by dint of patient trial and error. It is not as if we are looking at a complex piece of art, just a few scratches. I always apply the razor of David Hume in such cases; what is more likely? That a patient person, maybe a child, carefully scratched at a fossilised shell in recent times and produced a crude anthropomorphic image or that the carving is millions of years old? Back on topic! I recently found a sharks tooth in the shingle at Walton and noticed immediately that it had a very clear penetration at the top, exactly where one would expect to find it if the tooth were to be “strung and hung”. This I assumed had been washed out in pre-history found and worn and then lost or buried or it was a happy accident occurring naturally somehow. That site has a very long history of population. I have some fabulous bits and pieces from well defined, unmistakably worked lithic implements to a rim of LBA pottery with great thumb nail impressions in fantastic condition. I also have a flint pebble that looks like a half finished piece, with lines etched across the pebble where it was to be struck aligning perfectly with other cuts. Another piece of flint that has some cortex removed and highly visible percussion damage and curious circles etched into the remaining cortex on both sides joining up which resembles female genitalia! Again, this could just be natural and my over, and somewhat warped, imagination.